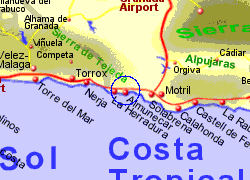 Situated approximately 20Km west of Motril, and 70km east of Malaga, the busy coastal town of Almuñecar sits in an attractive part of this coastline. 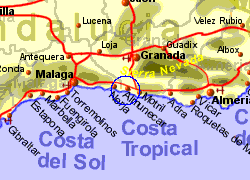 It is a good place to appreciate the beaches, checkout the Alpujarras and the sierra Nevada inland, or explore the city of Granada, which lies around 80km to the north. Evidence has been found of a fish salting industry in Roman times, with the necessary fresh water being chanelled in by aqueducts that survive today. The town also thrived on it's fishing industry in the time of the Moors. Today this busy town has all the facilities you may need and access to superb beaches. 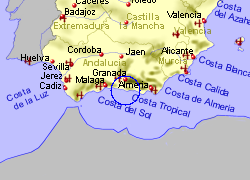 Map of the Almunecar area.